After fleeing Syria as a refugee five years ago, Sara hopes to study to be an architect so she can rebuild her home country. Tabshoura in a Box — a technology developed by Gulmakai Champion Nayla Fahed — gives Sara the STEM skills she needs to achieve her dream. There are 1.5 million school-aged Syrian refugee children living in Turkey, Jordan and Lebanon — but half of them are not in school. In Lebanon and Turkey, Malala Fund supports Fadi Hallisso as he helps out-of-school Syrian girls re-enter the classroom. Lack of transportation, restrictive enrolment policies, high fees and language barriers prevent Syrian refugee girls from continuing their education. We invest in digital learning technology created by Nayla Fahed that works without internet to help refugee girls catch up on lessons. In Lebanon, 41% of young displaced Syrian women were married before 18. We fund Hiba Hamzi's advocacy to raise the minimum marriage age to 18 so more girls can remain in school. Malala Fund’s Gulmakai Network supports the work of education champions in countries where girls face the greatest challenges to education. Local educators and activists understand the issues girls face in their communities — and they are best placed to develop solutions. Meet our Gulmakai Champions in the Syria region. Metin works to give more Syrian refugee girls access to education in Turkey. His organisation IGAM reaches out to parents to discuss the importance of girls’ secondary education and provides them with a mobile app that contains information on refugee services. Language barriers and differing education standards make it difficult for Syrian refugee girls to enter the Lebanese public school system. With LAL, Nayla created a digital learning platform called Tabshoura in a Box — technology that works without internet and electricity to help Syrian refugee girls catch up on their education before formally enrolling in school. 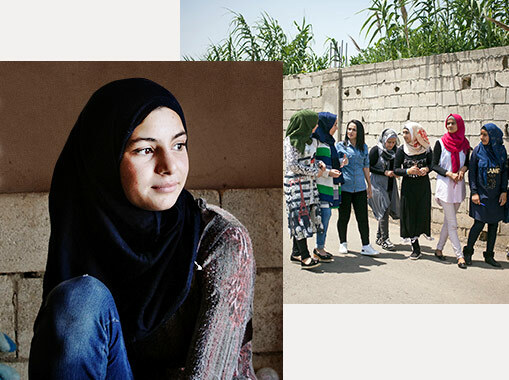 In Lebanon, Syrian refugee girls face the threat of early marriage. Hiba advocates to raise the minimum marriage age to 18 so more girls can remain in school. She also holds workshops to teach girls about the risks of marrying young. Basmeh & Zeitooneh provides relief services and training to Syrian refugees living in Lebanon and Turkey. As co-founder, Fadi oversees the expansion of the learning and leadership programme for Syrian refugee girls. As Vice President at Mavi Kalem, Gamze provides assistance to women and children in crises. She leads the organisation’s advocacy and community efforts to make it easier for Syrian refugee girls to enrol and remain in Turkish public schools. To help Syrian refugees in Lebanon catch up on missed classes, Azzam is developing and testing a secondary education remedial programme for students in grades seven through nine. He works with other Gulmakai Champions in the Syria region to advance this initiative. To improve retention rates and help Syrian refugee girls adjust to public school in Turkey, Özge leads a programme that trains educators on how to manage culturally diverse classrooms and teach Turkish as a second language. Hiba attended this year's United Nations General Assembly in New York and spoke directly to heads of state about why they need to increase funding for refugee education. Apple CEO Tim Cook and Malala Yousafzai announce new partnership and meet with Syrian refugees in Lebanon. In January 2018, Tim and Malala visited Lebanon and spent the day listening to Syrian refugee girls. With Apple’s support, Malala Fund expects to double the number of grants awarded by the Gulmakai Network. Gulmakai Champion Nayla Fahed pilots a new educational platform for Syrian refugee girls. Tabshoura in a Box works independent of internet and electricity, and provides a hot spot where students can connect computers and access digital learning resources. Nayla believes e-learning programmes can offer a path back into the classroom for refugee girls.